If you’ve ever gone through the packaging development process, you know how many variables and unknowns there are to coordinate. The project can quickly leave you feeling like you’re wrestling a three-headed monster. Once you knock out one area, several others rear their ugly heads causing you to have to keep forging ahead with a swinging sword. Although difficult, there are a few best practices you can implement to make this process more bearable. Here are 10 of our favorite ways to design a package and its various components and still meet your product’s brand and operational requirements today and in the future. From the packaging material supplier to the machinery suppliers and contract fillers, you are juggling a lot of critical tasks from the outside world. This can make communication a nightmare if you don’t get everyone on the same page early on. Loop in your suppliers from the start. This will help you reduce risks and ensure critical requirements, such as label design specifications, handling, and label application, are followed. The packaging development process has a lot of moving parts. That we’ve covered. Each of these parts costs money. That’s something that’s often neglected until it’s too late. When it comes to finding the right manufacturer and distributor, up front cash requirements are critical to consider. Bottle manufacturers, in particular, require large minimum order quantities (MOQs). For small companies, buying the minimum can still put a strain on the overall budget. Large companies also run into this dilemma often during product launches. What many people don’t realize is that distributors often have bulk inventory on hand. They’re able to sell this stock for a significantly lower cost than the MOQs required by manufacturers. Even though the per unit cost is a little bit higher, the overall bill is quite a bit lower. Talking to your distributor early on could save you money and time getting your product to market. Working directly with your manufacturers can help you get what you need faster and easier. Although it’s tempting to loop in other experts, cutting out the middleman can prove beneficial in the long run if they don’t provide additional added value like an inventory program or a broader expertise like a general contractor would. Have a custom container shape? You’re not alone. This is an excellent way to grab buyer’s attention, but be warned. There are many custom containers these days. One major packaging distributor has reported that custom containers are up 45% over the past year. You might want to apply for a patent to protect your design before it’s copied by others. Your label designs are just that – yours. Just like with your container shapes, it’s a smart practice to protect your label creative. By working with a creative brand designer, you’ll get exclusive rights to your design, which can prove beneficial when you seek quotes from suppliers. Are you renovating, or changing your packaging design? If so, you’re going to run into a variety of problems with designers, label producers, and other suppliers. Minimize the need for any container renovations by planning a bulk change on the entire brand portfolio at once. This way, you won’t need to go through multiple iterations and can get everything updated in one fell swoop. It’s easy to get caught up in the details that you forget to focus on the customer when designing your label and producing your product. This is dangerous. Every attribute of your product should enhance the customer’s end experience. From making your container easy to grab and hold to offering answers to customer questions on your labels, it’s important to keep the customer at the forefront of all your decisions. As you start making decisions, don’t lose sight of the overall process. Each step will need to feed into the other. Work hard to assemble an efficient supply chain among your suppliers and distributors from the get go so you’re not trying to widen process bottlenecks once everything gets going. While designing your prototypes and deciding on containers or labels, remember your constraints. Do you have required information, such as nutrition facts, that you must disclose on your labels? Does your manufacturer have certain regulations about container size or shape you must follow? Do you have to go through specific tests before your product shape, size, and label can be approved? Is your label design printable? Understand what constraints you’ll face during the process so you can prepare yourself for success in the future instead of setbacks. Every channel where you’ll be offering your product (grocery stores, drug stores, hotel chains, etc.) has a different strategy. One channel might sell using smaller packaging while another focuses on selling bulk supplies. One channel might sell only using photographs of the products while another sells in an environment where the customer can pick up and feel the product before buying. Know all of your channels while you plan your process so you can plan your strategy accordingly. 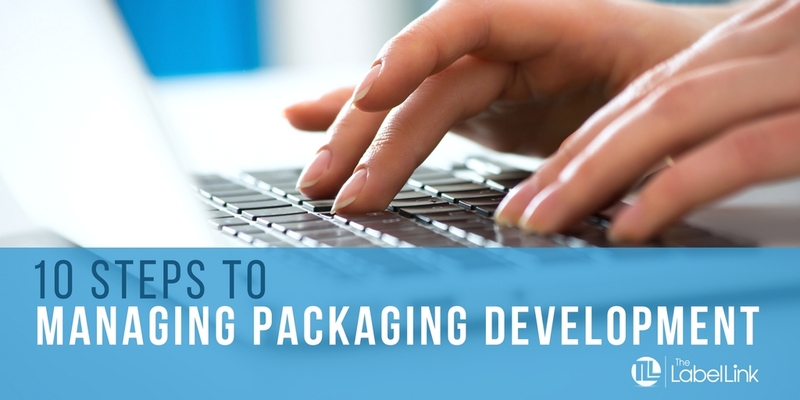 Question: What’s the hardest part about the packaging development process for you? There are a lot of moving parts, which can make this process extraordinarily difficult. The more areas where you plan to sell and the more container shapes you plan to distribute, the harder it is. As label producers, we like to be looped into this process early on so we can help you avoid any setbacks down the line. Shoot us an email now, even if you’re not ready to start printing your labels so that you can optimize your packaging development plan.